Smirnoff Vanilla Vodka 2 oz. 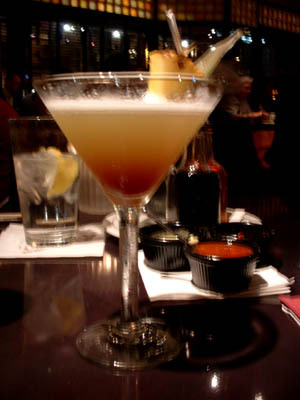 Garnish: A wedge of fresh pineapple or if you want to get fancy, use a toothpick and spear a pineapple wedge and pineapple leaf and hang on the rim of the glass. i love this martini, but i'm trying to find the pf chang's recipe for their asian pear mojito. any ideas? This page contains a single entry from Barflies.net :: Photos & Videos posted on March 21, 2005 11:41 PM. The previous post in Barflies.net :: Photos & Videos was Amazing Oak #1. The next post in Barflies.net :: Photos & Videos is SXSW Interactive - End of the Night. © Barflies.net 1999 - 2007, All rights reserved.